I am going to put a few arguments to rest. When did they stop running the 440 yard dash? In 1976, almost all Imperial (English) distances were abolished for track record purposes. The only exception was the Mile run because of its tradition and popularity. The mile (or 1609 meters) starting line is 9 meters back from a 400 meter track. UPDATE: The NCAA is proposing some amendments to the 2007 Rules Book that would reject the metric system in favor of the imperial system. Read the article here on The Finish Line Pundit Blog. POP QUIZ: Who holds the current 440 yard world record? Which is longer, 400 meters ot 440 yards? 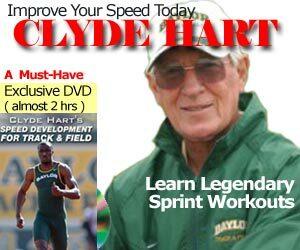 To convert a 440 yard dash to a 400 meter dash, subtract 0.3 seconds. In the above example, Tommie Smith’s 440 yard time is 44.8. That is equivalent to a 44.5, the exact time he ran en route to the 440 yard dash. Imagine that time with today’s faster synthetic tracks! To convert a 400 meters hand time to FAT, add 0.14 seconds. The reason is your distance to the starting gun smoke (not sound!) is relatively closer to you from the finish line, than the 100 meter or 200 meter starting gun. 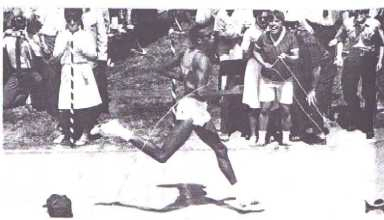 POP QUIZ ANSWER: In 1971 John Smith clocked 44.5 seconds in the 440 yard dash as a member of the UCLA track team. This is equivalent to a 44.2 400 meters. World History of the One Lap Race 1850-2005 by Roberto Quercetani. This book covers both Men’s and Women’s 400m and 4 x 400m relay, from Robert Philpot’s 49.5 in 1871, to Michael Johnson’s 43.18 in 1999, up to Jeremy Wariner’s 2004 Olympic victory. Notice how the title is called “one lap race” instead of the 400 or 440! A must read for any quarter-miler! So my 49.8 was the school record until 1993 and for a while they even converted my quarter mile time to 49.5 in meters, but when someone ran the 49.5 in 1993 they erased all my times as irrelevant. Doesn’t hardly seem fair. @DoubleD – as stated in the article, the conversion is 0.3 seconds. The other chap’s 49.5 400m = 49.8 440yd. Both your times should be listed as the school record (yours with an asterick). I’ve been toiling with how to approach the Athletic Director. I hadn’t realize the record been removed all these years until a recent visit back to the school. @DoubleD – you can always print this article, or send him the URL. Because my 440 yard dash was hand timed. Would I have to add 0.14 second to convert to FAT time. And that would result in Tommy Smith would have run a 44.64 sec 400 meter. 220 yards = 201.168 meters, so you would subtract 0.1 seconds to get the “equivalent” for 200 meters. 100 yards = 91.44 meters. The WR by 1968 was 9.9 for the 100m and 9.1 for the 100y. So you could add 0.8 seconds (or 0.9 for slower times) to get the 100y -> 100m equivalent. I ran the 70yrd dash in 7.50, what would that time be in 60meters. dude don’t worry about old HS records. had a coach tell me , once you set a record it’s yours and something you have forever even when it’s broken. How can you subtract .3 seconds for every time run? Wouldn’t the time difference be relative to the speed the runner is travelling? Hiram Caroll, as a high school junior ran an officially timed 48.0 secs in the 440 yard dash. It was reported to be a new HS American/world HS record. Date 1960, or 61. Albuquerque High School.